What is Plain Cement Concrete (PCC) in Construction of Foundation? Concrete has been used for many wonderful things throughout history, for either architecture or for infrastructure work and more. The term PCC stands for plain cement concrete. The mixture of cement, fine aggregate (sand) and coarse aggregate are generally called plain cement concrete (PCC). Before starting any R.C.Cor masonry work directly on the excavated soil, PCC is done to form a levelled surface and to avoid laying concrete on soil directly so as to avoid mixing/ with soil and also to prevent soil extracting water from PCC thereby weakening it. Plain cement concrete can also be called only “cement concrete (CC)” or “binding concrete”. Some even call it “Mud Mat”. Making of concrete is not easy. It has 4/5 main ingredients. PortlandPozzolonacement (P.P.C) is normally used for Plain cement concrete. It should conform to the specifications and tests. Sand to be used for concrete work should be clean, well graded, hard, strong, durable, and should meet the requirements specified for its use. Also Read: Ways to Check the Quality of Sand at Site! Aggregate shall be of an inert material and should be clean, dense, hard, Sound, Durable, Non-absorbent and capable of developing a good bond with mortar. Also Read: Why Aggregates Have an Important Role in Concrete? The size of the aggregate used for PCC varies from 10-12 mm to 40 mm depending on where they are to be used. If the size of the aggregate is more, it results in the reduction of cement consumption. Coarse aggregate shall be clean and free from elongated, flaky or laminated pieces. Coarse aggregate shall be of hard broken stone of granite or similar stone, which is free from dust, dirt and other foreign matters. The smaller size of the stone is 6.3 mm. All the course material should be retained in a 6.3 mm square mesh and should be well graded such that the void does not exceed 42%. Fine aggregate shall be of coarse sand consisting of hard, sharp and angular grains and shall pass through a screen of 4.75mm square mesh. Sand for PCC work shall be clean and free from dust, dirt and organic matter or based on standard specifications. Never used sea sand in foundation work. Also Read: How to do Foundation if Water is Present in Pit? Water shall be clean and free from alkaline and substances should be suitable for drinking purposes. Mixing should be done on a masonry platform or sheet iron tray. Stone ballast, sand and cement shall be poured/ mixed in a concrete mixer to maintain the required proportions. Machine mixing is always preferred, but under unavoidable circumstances, hand mixing can be done but all quality check needs to be assured. For maintaining the required consistency and control the addition of water, the slump test should be carried out regularly. A slump of 7.5cm to 10cm may be allowed for foundation work. Formwork centring and shuttering shall be provided as per the standard specification before laying concrete to confine to support or to keep the concrete in position. To prevent sticking of concrete, the inner surface of shuttering shall be oiled. 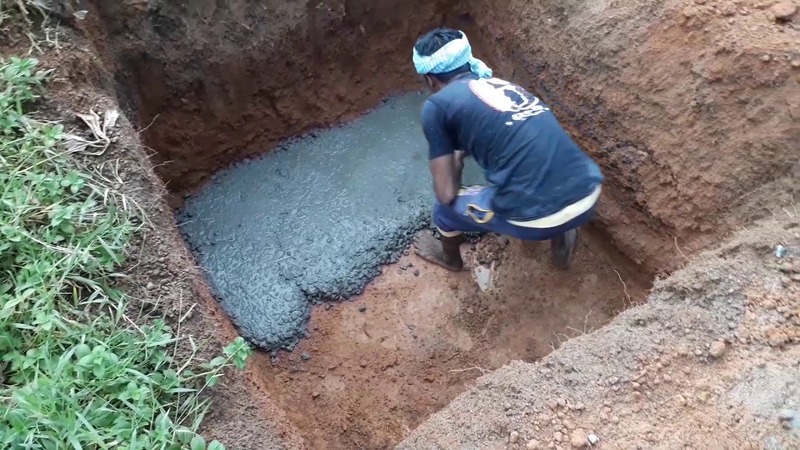 After two hours of laying of concrete, when the concrete has begun to harden, it shall be kept damp by covering with wet gunny bags for 24 hours. After 24 hours of placing PCC, keep the concrete surface moist by flooding with water or by covering with moist gunny bags. Curing of PCC may be done by either pouring water with buckets or with pipes. Curing should be carried out for a minimum 14 days. A strength of PCC is defined as compressive strength after 28 days, expressed as M15, M20, where M stands for Mix and 15 stands for 15 N/mm2 compressive strength at 28 days. The proportions of materials (cement, sand, coarse aggregate) for nominal mix/design mix concrete that are normally used are 1:3:6 or 1:4:8. As strength is not a major criterion, the design mix is generally avoided. Check and get the soil strata approved from the structural Consultant before doing of PCCin foundation. Dry materials should be uniformly mixed before adding water to it. Water should be mixed with a bucket, in a measured quantity, as per w/c (water/ cement) ratio. Use the chute or additional labour to pour the concrete where the depth is more. Remove any loose material from the sides of the pit, so that no soil or other material will collapse in the pit during concreting. If the water table is high, then de-watering should be carried out at the same time during concreting. Compact and level the concrete properly. Maintain the levels of PCC. The next day, mark the centre of the column. Also Read: What is Compaction of Concrete? Do not mix the materials on bare land. Do not just-pour the water in materials by means of a pipe. i.e. without any measurement control. Do not allow the PCC without formwork. Do not pour concrete without levelling and compacting. Do not pour concrete in the pit from a height of more than 1.5 m.
Do not allow extra cement mortar on top of PCC. for smooth finishing. As bed concrete below the wall footings, column footings and on walls below beams. As sill concrete to get a hard and even surface at window and ventilator sills. As to coping concrete over the parapet and compound walls. For flagging the area around the buildings. To make tennis courts, basketball courts etc. Storm/ Sewer at drains, small retaining walls.